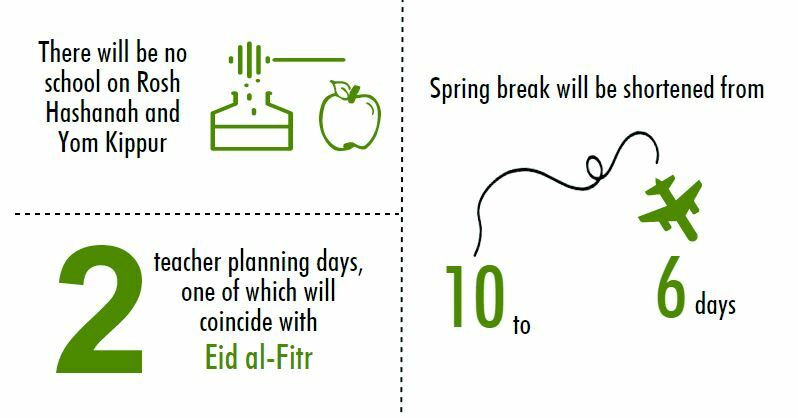 The 2018-19 school calendar—approved by MCPS Policy Management Committee members and adopted by the Board of Education Nov. 14—shortens spring break from 10 days to six and designates only two planning days for teachers, one of which will coincide with Eid al-Fitr. It will also include days off on Yom Kippur and Rosh Hashanah. The changes are in response to Gov. Larry Hogan’s Aug. 2016 executive order, which mandated that schools retain 180 days of instruction while starting after Labor Day and ending no later than June 15. Schools also have to include 15 closures required by state law. The approved calendar was the best option given these restrictions, SMOB Matt Post said. Many students expressed disappointment about having a shorter spring break. Some, however, acknowledge the importance of prioritizing closures on religious holidays over seasonal breaks. Many committee members are frustrated by the negative effects Hogan’s order has on students, committee chair Patricia O’Neill said. For teachers, the greatest issue will be decreased time to collaborate with colleagues and plan lessons, psychology teacher Sheryl Freedman explained. For now, Hogan has provided MCPS with minimal options for lessening these burdens in the future.